Keyboard controlled window moving and resizing utility. Is there a better alternative to MercuryMover? Is MercuryMover really the best app in Desktop category? Will MercuryMover work good on macOS 10.13.4? 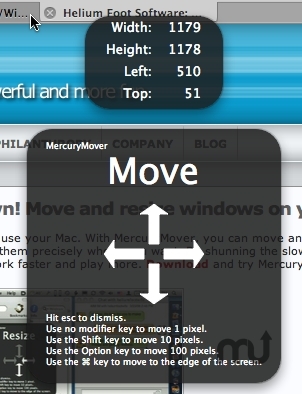 MercuryMover is the keyboard controlled window moving and resizing utility for Mac OS X. At its most basic, MercuryMover enables anyone to easily and conveniently move and/or resize the frontmost Window, directly from the their keyboard.